On Wednesday, October 5th, 2011, I was flying home from Atlanta back to Dallas. It had been a long day, and we had just finished speaking to AT&T about a new startup company I’m working with. Discussions included talk about iPhone and iPad apps. I was sad–quite sad actually. Here’s a man I had never met, and he had no idea who I was, yet I was profoundly sadden at the news. Even more, I was a bit shocked at how it affected me so deeply, until I began to reminisce at how influential Steve Jobs and Apple had been in my life. In 1981 when I was only 16 years old, my dad shocked us by spending $800 to buy me and my brother a brand new Apple IIe personal computer. With it’s 5 and quarter inch floppy drives, we were able to do some amazing things with this machine. We would spend hours programming it, taking it apart, putting it back together and just experimenting with this incredibly powerful new toy. I soon learned the power of “word processing” and how fast you could type and store documents on the floppy drives. I was quickly using our new personal computer for school reports and research. Then after school, my brother and I would play games like Karateka, Lode Runner and Rescue Raiders. I continued using the Apple IIe into college. Writing papers and programming were an everyday task for me. One of my first classes at Texas State was a BASIC computer programming class. How amazing was that! Now, they had classes on how to program the computer. My first purchase at college was a 300 baud modem. At home, I could simply dial into a special phone number, listening to the rhythmic cadence of modem handshake for a few seconds, and then suddenly, I’m logged into the school computer. Incredible! I didn’t have to drive to the school campus to code my program. After transferring to the University of Texas at Austin in 1986, I soon started seeing a new Apple computer on the scene — the Apple Macintosh. It started popping up all around campus. But, it sure looked weird. The monitor was built into the computer and a new 3.5″ floppy drive appeared on the screen. At first, I didn’t like it much. The new Microsoft machines were in color and the monitors were separate. It seemed like that was the way to go. 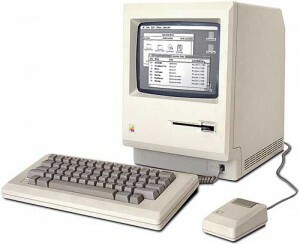 But, soon after having to program on the PCs, I realized that I enjoyed the Apple Macintosh much more. So, in college, I purchased an Apple Macintosh SE. People were using it for a variety of purposes–word processing, spreadsheets, and accounting. But, something different about this computer got my attention. First, it had a mouse–a small hand controller with a single button to navigate around and click on the screen. Wow, that sure made working on the computer much easier. Secondly, it has this amazing ability to manipulate graphics and images with ease. And, with this powerful sound program, you could edit and manipulate audio with incredible precision and simplicity. I remember seeing those sound saves on the screen, and I could simply cut one section of audio and paste it somewhere else. While at UT, I took a 3D computer graphics course. The goal for the entire semester was to program a Macintosh SE in Fortran to manipulate 3D objects in a 3D world. We had to study the 3D space formulas and camera angles. By the end of the semester, I had compiled a working program that could input 3D models and show them on the computer screen. I was so proud of my little 3D program on a Mac. As I moved to Dallas to take my first job at Uniden, my brother came up one summer to intern. During the summer, he stayed with me. One of the fond memories I have was how we networked our two Macintosh SE’s together to play a flight simulator. In this game, we would dogfight by flying around this virtual world trying to shoot each other down. The loser had to clean up the kitchen. We did this for hours. While working full time now, my next Apple computer was a pretty sweet machine–the Apple Quardra 630. It was a beefer machine, and it was even more powerful that the SE I had previous. What made this machine memorable to me was the fact that you could now connect to this thing called the internet. My first email address was [email protected] I purchased a simple dialup plan for $29.95 and soon I was calling into to a 56K modem bank and browsing AOL and Yahoo, the only two websites at the time. Things were beginning to change. In 1997, I purchased my first video editing software called Media 100 for the Mac. It was both a hardware and software package. Initially, I used Adobe Premiere as my editing software, but soon switched to Media 100’s entry level video editing software. Video editing required pretty extensive hard drive space, and you had to use fast hard drives, usually requiring a RAID array. So, I plopped down $2,000 for a disk array system holding four high-speed drives with an amazing 8GB of disk space. With that setup, I could edit up to 30 minutes of Standard Definition video. It was awesome! Soon, I was editing and creating home videos. I quickly learned After Effects at the recommendation of a friend who was also in video production. I also learned a new program called Bryce that let you create these virtual 3D worlds quite easily. Then, it happened. I made my first 30 second commercial using my Apple editing system with Media 100, and I got paid for it! Everything began to change after that. Though I worked in corporate America by day, at night I would stay up late and play with my new found passion — media production. During this creative season in my life, I went through quite a few Apple computers. The model numbers were a blur, but I do remember getting Final Cut Pro. While I liked Media 100, it was pretty limited in what you could do. You only had two video tracks, some graphics tracks and some audio tracks. The editing was clean and the playback smooth, but you were pretty limited in what you could do. 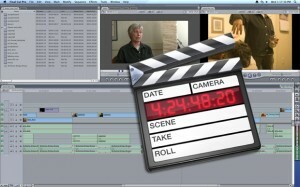 Then, a friend told me about Final Cut Pro. I researched it a bit, and fell in love with it. Soon, I was editing more and more. With my creative mix of Final Cut Pro, Adobe After Effects and Adobe Photoshop, I could create quite a bit. Most of my paying work at the time was with After Effects. In 2007, I fulfilled a dream. I produced, directed and edited a full length feature film called Fissure. One of the most amazing aspects of that experience is that I edited the entire feature film on my home computer — an Apple PowerPC G5 computer with Final Cut Studio. An entire feature film on my home computer. Through the years, I went through Macs pretty quickly. The Mac G3, G4 and G5 towers were pretty amazing! Just a few years ago, I finally ventured into the Intel version Mac computer, the Mac Pro. Today, I use a pretty sweet machine, the 8-core Nehalem Mac Pro computer. It’s loaded with software and I use it for a variety of work functions. A few years ago, I also purchased a PowerBook, my first laptop. With Final Cut Pro loaded, I was able to do some amazing things while being mobile. I would often use it for onsite editing for clients or projects. 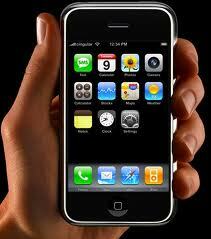 Another interesting Apple product was the iPhone. Rumors started emerging while I was working for Nokia. At the time, Nokia was the cell phone king, dominating the market and quite proud of it. Then, Apple changed all that. They launched the iPhone. It was a bit awkward for me. I was working for Nokia but I loved Apple products. It was like my parents were getting a divorce and I had to choose. But, the choice got easier in 2005 when I resigned my position at Nokia to launch my own production company, Top Pup Media. 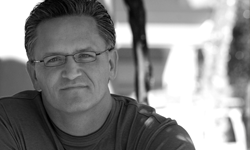 Today, my business produces hundreds of videos for a variety of clients, including many Fortune 500 companies like AT&T, Nokia, Haggar, BP, Fluor and many others. We’re a Mac production house and continue to use Mac products every day in our business. 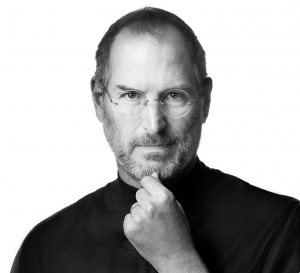 I can’t express how much I appreciate all that Steve Jobs did by bringing Apple computers and devices to our generation. What an amazing, creative and visionary individual! His innovativeness and execution made a way for me to live my dreams. For computer idiots like me, that made a lot of sense! Way to go Russ. I remember working with you at Uniden and the user features you outlined and designed in the Home Satellite Receivers during the “Big Dish Days” were cutting edge. Lots features we take for granted on Cable, and Satellite today. Keep up the good work. Glad your following your dream.